If you lived in Goleta in the late 60’s and early 70’s, you may remember seeing these almost comical looking aircraft flying around, but do you know they served a very serious purpose and helped man land on the moon? They were called Guppies, and their story is quite interesting. It all started with this guy, Jack Conroy. A remarkable man, he was a part time actor, a bomber pilot in WW2 and survived time in a German POW camp. After the war, he was an airline pilot and was in the Air National Guard, where he set several flight records. One evening Conroy and his friend Lee Mansdorf were discussing the problem NASA was having transporting rocket booster stages aboard ships through the Panama Canal. 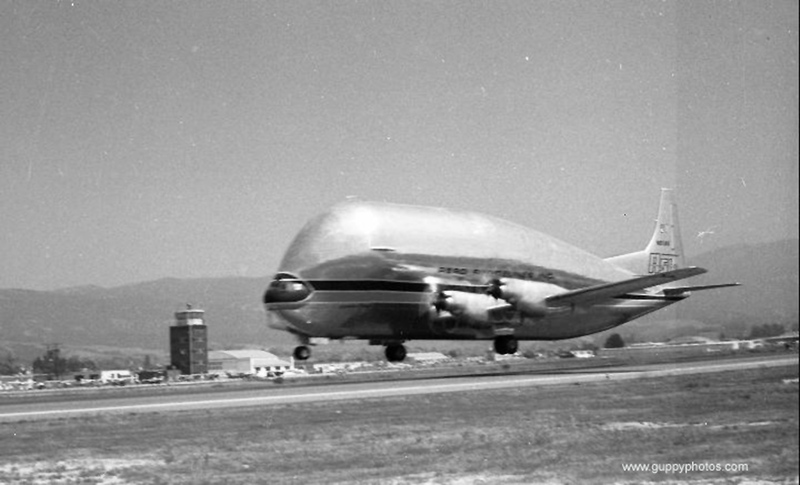 Mansdorf had recently purchased several surplus Boeing Stratocruisers but was not really sure what to do with them. Conroy believed that they could take one of the Stratocruisers, enlarge the cargo area to hold a rocket booster and contract with NASA to fly the boosters from California to Cape Canaveral, Florida. Conroy presented his plan for the modified plane to NASA, where an official said it looked like a pregnant guppy. The name stuck. Even though NASA was lukewarm on the project at first, Conroy mortgaged his house and started a company with Mansdorf called Aero Spacelines to pursue the project. The aircraft first flew on September 19, 1962, piloted by Conroy and co-pilot Clay Lacy. When Van Nuys traffic control realized that Conroy intended to take off, they notified police and fire departments to be on alert, but the huge aircraft performed flawlessly. One year later, the Guppy carried rockets for NASA and saved three weeks transit time versus the barge method they were using before. The Pregnant Guppy’s first flight was a little over a year after Kennedy’s famous “to the moon by the end of the decade” speech. It’s a little known fact that the Guppy played a significant role in Kennedy’s dream of getting to the moon by the end of the 1960’s. 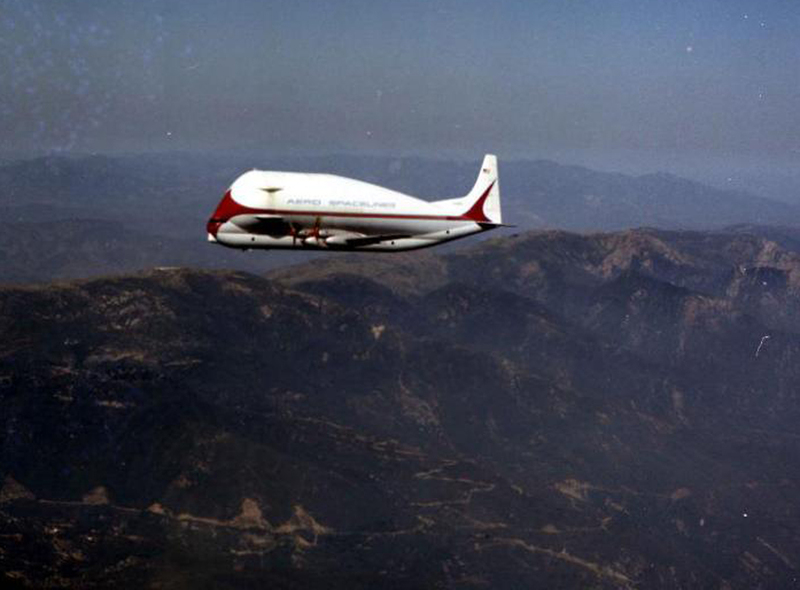 NASA was given top priority to meet this deadline and the Guppy made it happen. 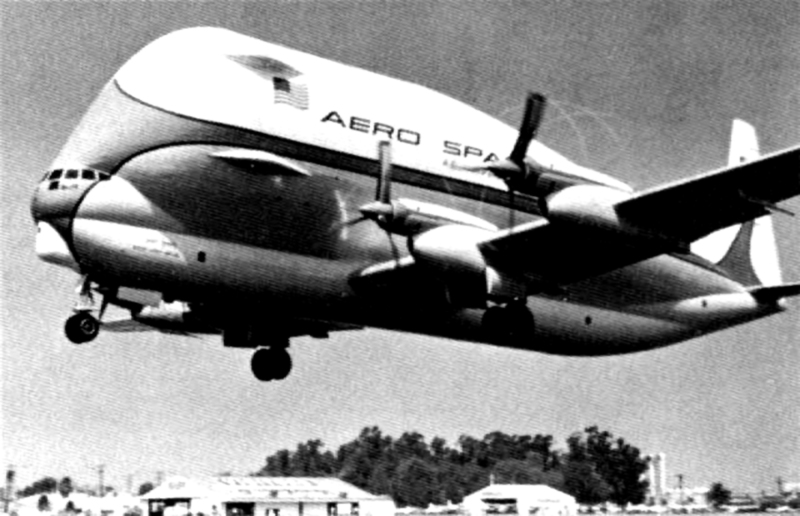 The Pregnant Guppy was so successful that Aero Spacelines built a second larger Guppy for larger, heavier loads. 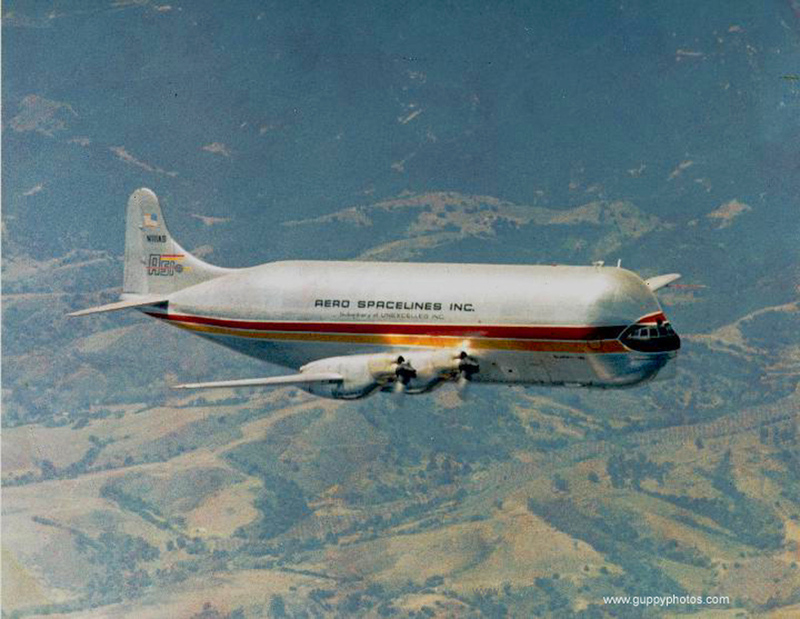 The Super Guppy flew for the first time just short of three years after the Pregnant Guppy on August 31, 1965. 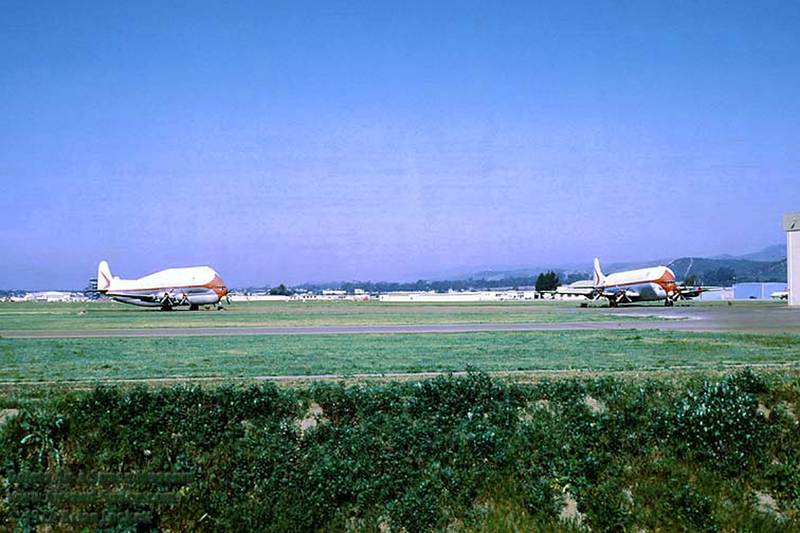 In 1966, Conroy relocated Aero Spacelines from Van Nuys to the Santa Barbara airport at Goleta. Once relocated to the Santa Barbara airport, construction began on several large hangars where four more Super Guppies would eventually be built. 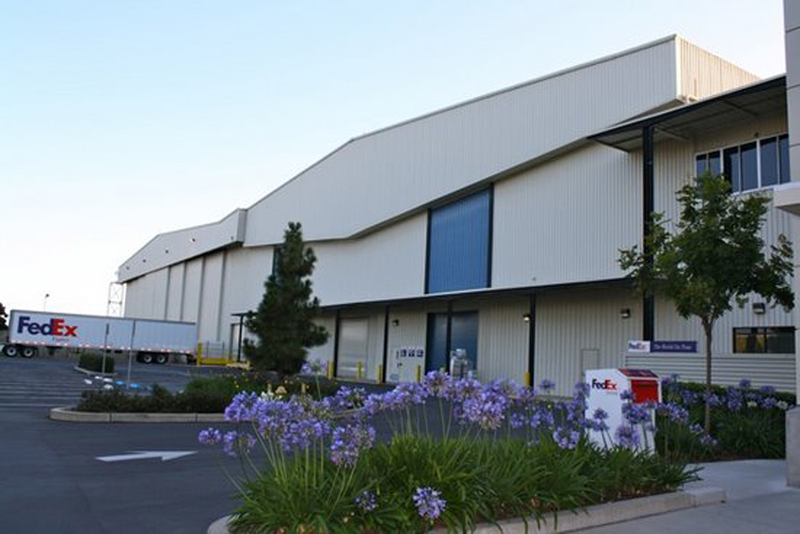 These hangars still exist today and are being used by FedEx and others. 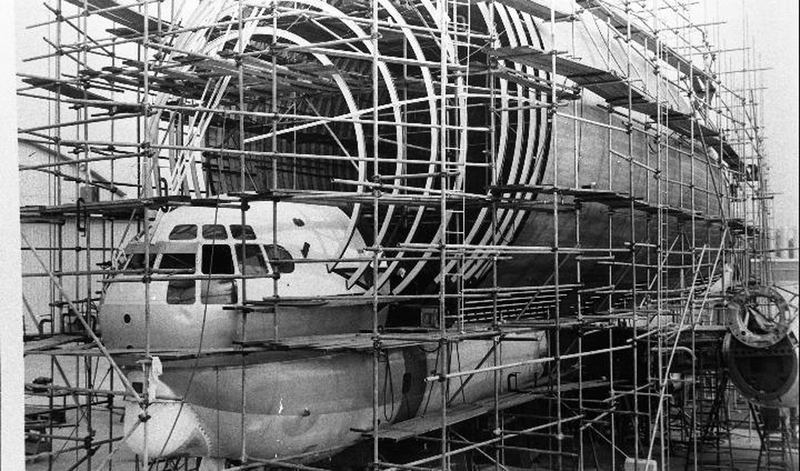 While the hangars were being built, the first Mini Guppy was under construction on the mountain side of Hollister Avenue. It was built in a temporary location between the recently demolished WW2 hangar, seen in the background above, and the Airport drive in theater. 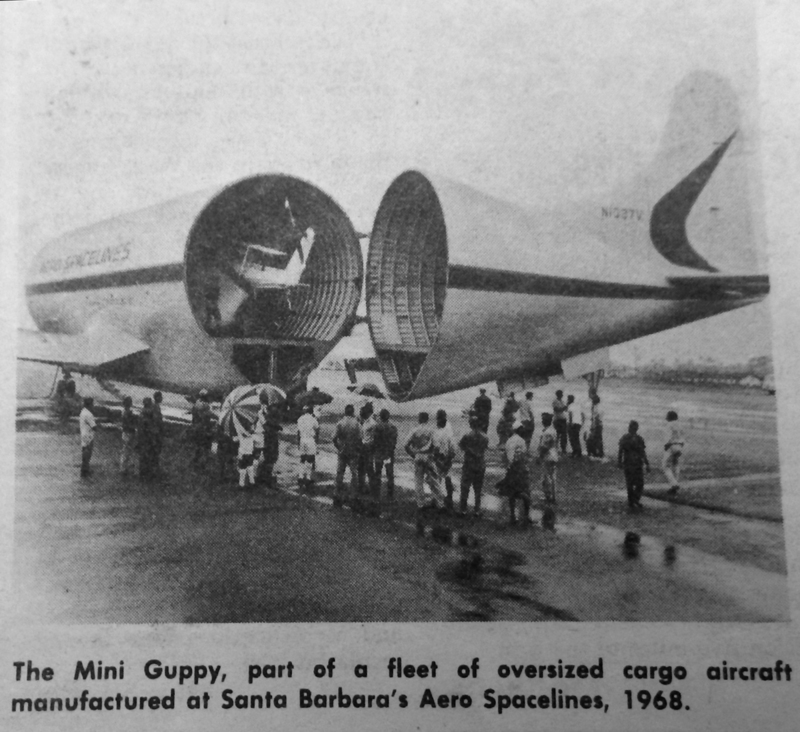 The Mini Guppy was christened “Spirit of Santa Barbara”, on May 24, 1967. 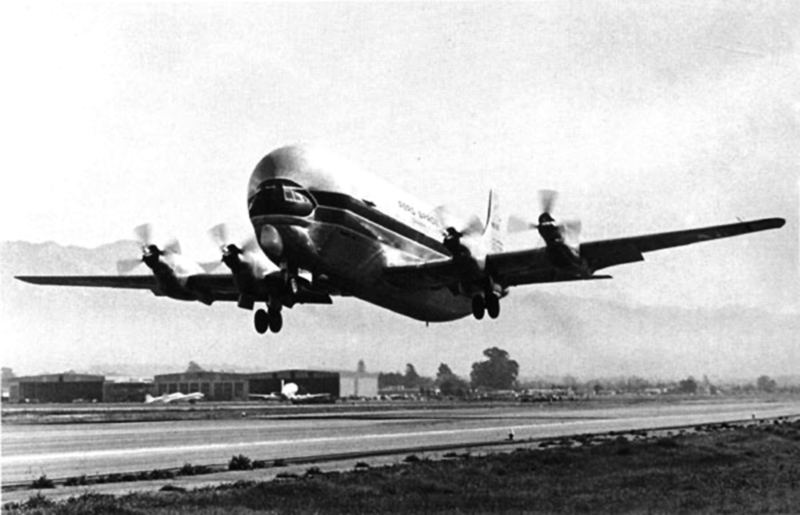 Two days later, the Mini Guppy was carrying cargo to the Paris Air Show, where Conroy was awarded the “Medal of Paris” for the greatest contribution to aerospace for the prior two-year period for the Guppy aircraft. 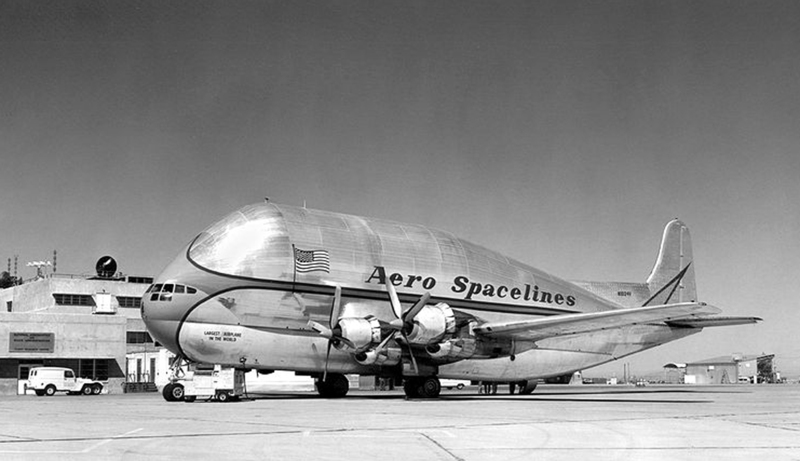 Aero Spacelines operated the Mini Guppy for several years, transporting cargo until 1974 when it was sold to American Jet Industries. It changed hands several more times through the years and has been retired to the Tillamook Air Museum in Tillamook, Oregon, where it resides today. A second Mini was built in the hangars on Fairview Avenue and named the Mini Guppy Turbine. Unfortunately in 1970 the Mini Guppy Turbine was lost, along with the entire crew, in an accident during flight testing at Edwards Air Force Base, California. No more mini Guppies were built. Notice in the background the Super Guppy parked in front on the Aero Spacelines hangars. The Super and the Mini Guppies, resting at home in Goleta. 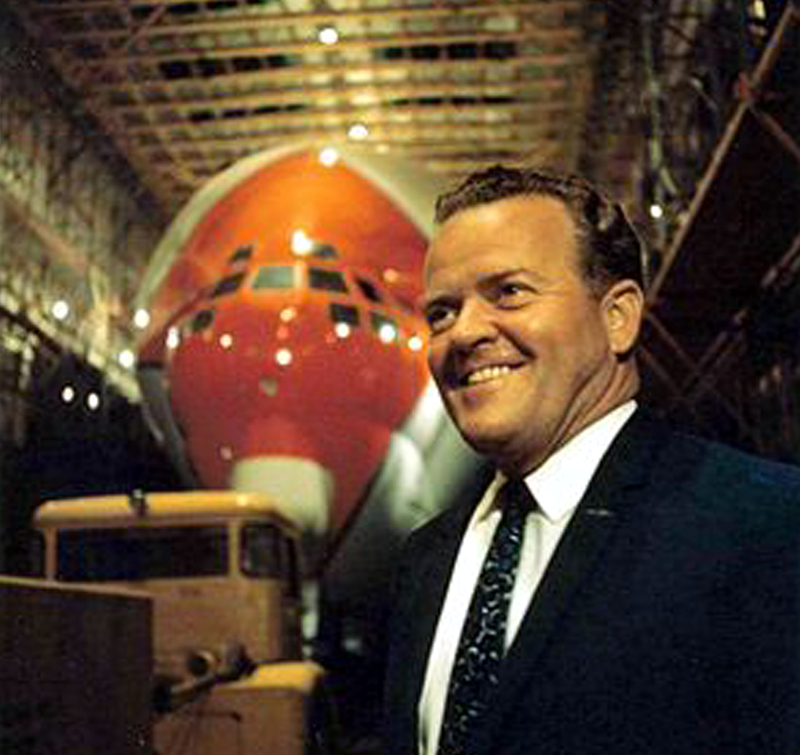 In 1967, Aero Spacelines encountered financial difficulties and Conroy was forced to sell his company. His design was so practical and necessary, it’s still in use today. 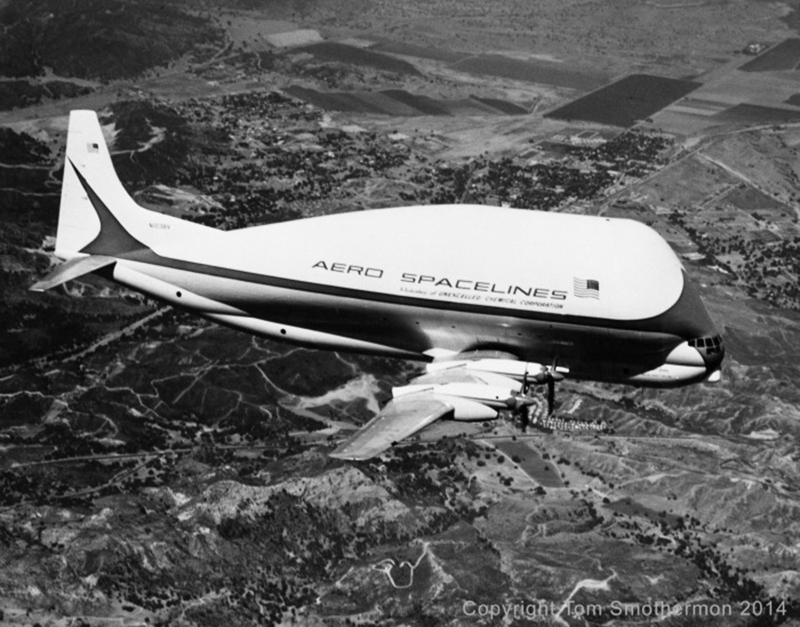 NASA currently uses a Super Guppy manufactured by Airbus Industries. For a while these unusual looking planes were a common sight in the skies over Goleta, and while many of us may have forgotten about them, they left their mark in aviation history and their legacy lives on. Sources: allaboutguppys.com, aviastar.org, guppyphotos.com, Aviation Week and Space Technology magazine, Brian Lockett, Urban Hikers, Santa Barbara News Press, Edhat, Peter Hartmann & Stacey Wright, Henry L. Fechtman and special thanks to Tom Smothermon. In the 60’s I was a newsreel cameraman and worked for newsman Clete Roberts. I climbed up to the top of the Super Guppy, which was under construction and at the time was called the Very Pregnant Guppy. Boy of boy did I suffer from Vertigo! And I had the privledge of meeting Jack Conroy. Can any one give me the name of one of the pilots? He may not be alive today but I recall many of his stories where he would have to jettison water they carried aboard aircraft for ballast. I recall also that Conroy also developed a DC3 That was modified to land with a nose wheel . I believe he was also a good friend of Floyd Dodson who is now in his 90″s and still married to Billie Heron who once won the powder puff with her pilot who introduced me to the guy who taught me to how to fly and whose name has long been forgotten. I will forward your question to the resident Guppy expert. Whenever we saw a Guppy about to take off we would watch and urge it up with shouts of “come on you can make it”! It Just looked too heavy to reach the sky. When we saw it was about to land we would hold our breath because it looked to heavy for a smooth landing. Goleta folks really love those Guppies! Just last week some of us were reminiscing about the good old days and the Guppy was part of those memories. My Dad was on the airport commission in the early 1960s and 1970s. I remember those Guppies… clear as day. Oh yes, those Guppy days back in Goleta. I used to work in Santa Barbara, but lived at the Santa Barbara airport at the “Pilot House Motel”, where I paid a monthly rent of $125.- , new sheets, towels and coffee included. For a bachelor it was a great deal. The manager couple was Tommy and Myrna, although I am not certain about her correct name, but her earlier name was Madden, she was the mother of Dave Madden, who was a movie actor, possibly in “The Partridge Family” or such. At the time (1968) she was 68 and Tommy was 85. Their dog’s name was – how else could it be – Pilot, a black Puddle type or such. They had a couple photographs of Lear Jets on their office walls, that sported Swiss flags on the tail, which made me curious, because I was an import from Switzerland. They informed me, that the early versions of the Lear were modified Swiss editions of what we knew as the P-16, of which two ended up crashing in Lake Constance, after which the program was terminated and Bill Lear took over his version of the design. To get back to the Guppies, because the Pilot House Motel’s one set of rooms was located on the taxiway , one of which I rented, we could easily see them take-off and land, typically on runway 7 or 25. It was Tommy & Myrna who informed me, that those things were manufactured right there at that airport. I do remember the Guppies flying overhead when I attended I.V. Elementary between 1970-74, that got me hooked in aerospace. 20 years later I was working as a aircraft mechanic and painter in the same hangars they were built. Wow, that is awesome Nigel. They were a sight to behold. Always stopped us in our tracks….P.S. My wife was at IV school the same time as you! My Dad was an electrical engineer at the GM AC Electronics Division in Goleta in the 60’s and he would drive us to the airport to see the Guppies being built. I remember we even got some of the aluminum “scrap” from the workers, and as an 11-year-old we thought that was pretty cool! Was just looking around for some old memories, found them here. My Dad was an aeronautical engineer and he worked this project. I can remember being in awe of the plane whenever I walked into the hanger. Nice to see the old pictures. Glad to rekindle fond memories…. Working for North American Weather Consultants in the Administration Building, the noise would tip us off to get to the ramp. All three guppies were tested with JATO bottles. That was a sight – monster airplane barely getting off the ground, suddenly going up at 30 degree angle, then barely lumbering along again. Visited friend Walter Dodson often when he worked on various Conroy projects such as CL-44-O. I remember my mom taking my brother and I to Goleta Beach and seeing those planes seemingly float over us. Great to see this article.